Pigs are the topic of this episode of Reading Rainbow, as LeVar Burton welcomes some familiar friends from Sesame Street. 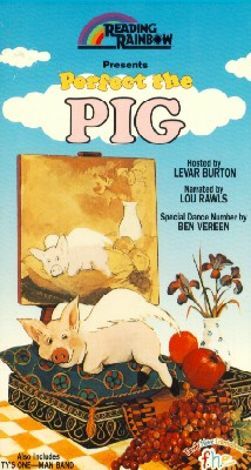 Kermit the Frog has a special talk with Burton regarding his relationship with Miss Piggy, and the featured story involves a pig whose wish to fly is granted. Life seems wonderful for Perfect the Pig as he soars through the air and makes a new friend. But there are clouds on the horizon for Perfect. There is a discussion about "pigericks," which are pig poems, and the panel of child reviewers looks at Poinsettia and her Family by Felicia Bond and Hector, the Accordian-Nosed Dog by John Stadler.